by CitizenLink Team: More than a billion tax dollars were spent over a three year period on groups that promote abortion. In a report released from the Government Accountability Office, six abortion sellers, including Planned Parenthood, received $1.5 billion. 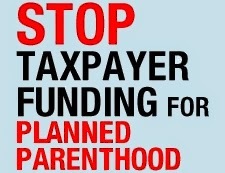 Planned Parenthood and its affiliates received $344.5 million in federal funds and another $1.2 billion from Medicaid, which includes federal and state funds. That’s a total of $1.5 billion over the three year period. The new data is part of a records request made by United States representatives in 2013. The report covers funding from 2010-2013. The six organizations researched are Planned Parenthood; Population Council; International Planned Parenthood Federation of America; Guttmacher Institute; Advocates for Youth; and Sexuality Information and Education Council of the United States. FOR MORE INFORMATION: Read the report. Tags: Abortion Groups, Spend, Billion of Your Tax Dollars, Stop Tax Payer Funding, abortion To share or post to your site, click on "Post Link". Please mention / link to the Greater Fitchburg For Life. Thanks! Woman Who Killed Her Unborn Baby at 25 Weeks, Threw Infant in Dumpster Gets 20 Years in Prison Purvi Patel was arrested after she took abortion pills to take the life of her viable unborn baby. Patel later admitted to police that, after taking the baby’s life, she had placed the newborn in a dumpster behind a local restaurant, which her family owns. Brian Church, Catholic Vote: Last Friday, I warned that LGBT activists will not stop at marriage. The current uproar in Indiana is proof. Last week Indiana Governor Mike Pence signed their state ‘Religious Freedom Restoration Act’ into law. The law is nearly identical to the federal law introduced by Senator Charles Schumer, passed 97-3 by the Senate, and signed by President Clinton in 1993. The law protects the freedom of all people of faith to live, breathe, and practice their faith as they see fit. No person of faith can be discriminated against unless the government can show that it has a compelling reason to do so. The LGBT backlash is now in full throttle. Corporations like Apple, Yelp, Salesforce, PayPal and others are threatening to stop doing business in the state unless they repeal the law. Openly gay Apple CEO Tim Cook essentially said: unless Indiana law allows discrimination against people of faith, he and his Silicon Valley bullies will destroy them. Indiana’s new law is nothing new. The federal government and 19 other states have similar laws. The law does not allow anyone to discriminate against gay people for any reason. If a gay person were to order a pastrami sandwich, a deli owner could NOT deny him service under this law. People of faith that wish to abstain from morally cooperating in gay weddings can do so, and gay people are free to take their business to the thousands of other photographers, florists and banquet halls. It’s called freedom. It’s what we do in America. Can you connect the dots? Gay marriage is just the start. What irks LGBT activists so much about this new Indiana law is that it strips them of the right to IMPOSE their agenda on you! Next month the Supreme Court will hear arguments on the question of whether to legalize gay marriage across all 50 states. This week the Justices will receive our amicus brief. And you can still get a commemorative copy of CV’s amicus brief with your donation by midnight tonight (Pacific Time). Marriage is not the end game for the sexual liberation left. Their radical goal involves dismantling the nuclear family and annihilating the Judeo-Christian understanding of human sexuality, and even religious freedom itself. I never thought I would say this, but Bill Clinton was right. Indiana Protects Religious Liberty. Why That's Good Policy! Tags: Indiana, Governor Mike Pence, Religious Freedom Restoration Act, Apple CEO, Bill Clinton Bigot, Brian Church, Catholic Vote To share or post to your site, click on "Post Link". Please mention / link to the Greater Fitchburg For Life. Thanks! 40 Days for Life, Mar 2015, 1st Campaign, Day 41: Wrap-Up - 402 Babies Spared - It Worked! Shawn Carney, Campaign Director, 40 Days for Life: Children who were scheduled to be aborted are alive today ... because over these past 40 days, God blessed your prayers and peaceful vigil. … 402 babies saved from abortion during this 40 Days for Life campaign! As we enter what’s often called “the week that changed the world,” we journey through the passion, death and resurrection of Jesus Christ. Our Lord and Savior’s victory over death is the source of our hope – hope for ourselves ... and hope for our culture. 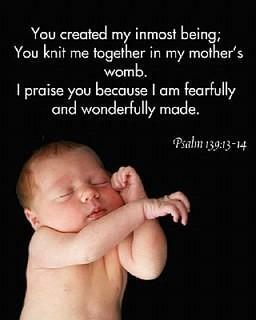 Thank you for being that witness of hope in a culture of death! This campaign showed how brightly light can shine when it is courageously brought into the darkness. We have a final devotional for this campaign today … and, as always, a few stories to share. “It worked!” Those were the words of a young woman who had been sitting in her car in the parking lot of the abortion center in Grand Rapids, talking with a friend who had an abortion appointment. Michelle, the 40 Days for Life leader in Montgomery, said prayer volunteers witnessed two saves on one day. One of them did not come easily. As they talked quietly with the counselors, a man whose child was being aborted inside the building angrily approached the couple and insisted that she go through with the abortion. “We have no idea why he was interfering and so adamant,” Michelle said. “All we know is that when the sidewalk counselor said ‘in the name of Jesus, get away,’ he fled immediately.” Finally, the couple drove away. They did not have the abortion. Unfortunately, not every story has a happy ending. But God is in control. Sean in Roanoke says the 40 Days for Life team was asked to pray for a woman planning to abort twins. But a few days later, the woman went through with the abortion. “I am mourning this great loss,” he said. On that note, we end this campaign but continue the battle, knowing in the end that Christ has already claimed the victory. Tags: 40 Days for Life, Mar 2015, 1st Campaign, Day 40, Day 41, Wrap-up, 402 babies saved, Grand Rapids, Michigan, Montgomery, Alabama, Roanoke, Virginia To share or post to your site, click on "Post Link". Please mention / link to the Greater Fitchburg For Life. Thanks! Simple Sunday Message: In Case You've Forgotten . 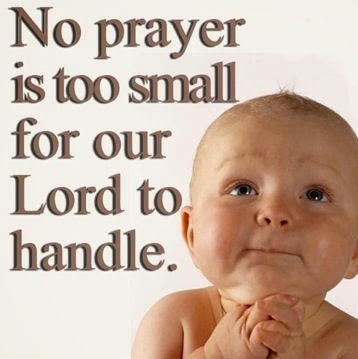 . .
No Prayer Too Small for Our Lord To Handle. Tags: No Prayer, too Small, for God To share or post to your site, click on "Post Link". Please mention / link to the Greater Fitchburg For Life. Thanks! Shawn Carney, Campaign Director, 40 Days for Life: Ten years ago ... after we held the first-ever 40 Days for Life campaign ... we thought it was just going to be a one-time effort. But since then, God has taken this campaign from Bryan/College Station, Texas to places no one could have imagined. It has seen blessing after blessing ... with lives saved from abortion, abortion centers closed ... and even the hardest hearts touched and transformed. Only God could do this! We wrap up this campaign with a look at three countries where 40 Days for Life is growing rapidly – Mexico, Romania and Croatia. This vigil is at outside a Marie Stopes abortion facility in Coyoacan, which mysteriously shut down about three weeks ago. The leaders hope the closure is permanent … but their vigil continues. This campaign has recorded five saved babies ... including a set of twins. The other vigils are just as strong. Tere, the leader in Iztapalapa, said there are often as many as 30 people praying, and the local bishop has asked every church to participate. Dan and Julia are the campaign directors for a first-time campaign in Cluj-Napoca, one of the largest cities in the country. “The leader of the pro-life movement in Romania is astonished they achieved such an amazing task of doing a campaign in a textbook fashion and wants to know how they did it,” said Robert Colquhoun, the international outreach coordinator for 40 Days for Life. Around 600 volunteers have participated so far in 40 Days for Life … and there are 10 different cities interested in hosting their own campaigns. Ante Caljkusic, who brought the first 40 Days for Life vigil to Zagreb, has watched as the outreach has now spread to ten cities in his country in the past year … and it could expand to 16 or 17 for the next campaign. It may be spreading to adjacent countries as well. The campaigns must be touching consciences. There were protests reported in two cities, Pula and Split. In Pula, volunteers continued their peaceful prayer as women chanted insulting slogans. In Split, a few people showed up to demonstrate … but they were surprised to find around 100 people in prayer! The next campaign runs from September 23 to November 1. Will your community be part of it? Please pray about it as this campaign draws to a close. Tags: 40 Days for Life, Mar 2015, 1st Campaign, Day 40, Mexico, Romania, Croatia To share or post to your site, click on "Post Link". Please mention / link to the Greater Fitchburg For Life. Thanks! Pro-life advocates in Texas report they were assaulted by a woman with an incendiary device on Monday night. “Eyewitnesses say Melanie Maria Toney, 52, threw the explosive out of her car window at pro-life advocates as they prayed as part of the 40 Days for Life vigil, but they were able to stomp out the fire before the bottle exploded. “The Central Texas Coalition for Life reported the attack – and the fact that the woman had been arrested – last night. Toney has been charged with aggravated assault.”The article states the woman allegedly hurled a Molotov cocktail at a group of volunteers outside an abortion clinic; the group was praying as part of 40 Days for Life, a prayer campaign underway right now. Tags: Texas. 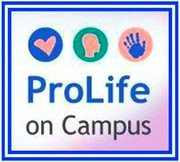 pro-life, prayer volunteer, attacked molotov cocktailINSERT TAGS To share or post to your site, click on "Post Link". Please mention / link to the Greater Fitchburg For Life. Thanks! Shawn Carney, Campaign Director, 40 Days for Life: Your prayer presence hurts the bottom line of the abortion industry ... especially on Saturdays. Saturday is the busiest day of the week at many abortion facilities … so please find a campaign location and join the vigil! You never know what God may have in store. You may see your prayers answered as a mother turns away from abortion. Or you may even see a closed sign on the abortion business’s door! Toni in Winston-Salem says the Planned Parenthood center has been closed several days during the campaign, including at least one Saturday … which is usually an abortion day. “This campaign is definitely affecting business for them,” Toni said. She mentioned a couple driving into the parking lot who looked at the prayer volunteers … but did not stop to talk. After about five minutes, though, they turned around and drove out. They never went inside. “I just found out that a young woman who had an abortion scheduled at Planned Parenthood did not go through with it,” said Nikki, the local 40 Days for Life leader in Pittsburgh. “She didn’t want an abortion, but finally succumbed to the steady pressure of her boyfriend, made the appointment and went to Planned Parenthood,” she said. But when this woman saw the volunteers praying, she decided not to do it. The volunteers gave her information about local pregnancy resources and told her to get in touch if they can help in any way. Tags: 40 Days for Life, Mar 2015, 1st Campaign, Day 39, Winston-Salem, North Carolina, Pittsburgh, Pennsylvania, Tucson, Arizona To share or post to your site, click on "Post Link". Please mention / link to the Greater Fitchburg For Life. Thanks! An ambulance was called to South Wind Women’s Center abortion facility in Wichita, Kansas, for a woman experiencing a medical emergency on March 26, 2015. Abolish Human Abortion : An Abolitionist takes a walk around an abortion clinic that was shut down by pro-life legislation! Tags: Closed abortion center, pro-life vidtories, Abolish Human Abortion To share or post to your site, click on "Post Link". Please mention / link to the Greater Fitchburg For Life. Thanks! 40 Days for Life, Mar 2015, 1st Campaign, Day 38: It's not too late! Shawn Carney, Campaign Director, 40 Days for Life: Have you gone to pray at your local 40 Days for Life vigil yet? For some, the answer is, “I really wanted to ... but just never made it out there.” If that’s you, then I have good news – it’s not too late! You still have today, tomorrow and Sunday to go out and make a difference. Here’s the link to the 40 Days for Life locations. Find one … and please go pray. You just may see a life saved. That’s what happened to me during my stop in St. Louis! I had a great visit at the St. Louis 40 Days for Life campaign in front of the only abortion facility in Missouri. The leader, Brian Westbrook, also leads the St. Louis Coalition for Life. Brian courageously left his job as an engineer to do full-time pro-life work and has helped save many lives in St. Louis. The local Thrive pregnancy center has a mobile ultrasound bus outside this large Planned Parenthood center. As all of us were there praying, a mom left Planned Parenthood and went into the bus. While a handful of people prayed at the 40 Days for Life vigil in Louisville, a young woman and her male companion went into the abortion center. As they walked towards the building, a counselor was offering to help them. But still, they went inside. Before too long, though, they returned to the sidewalk and met the counselor … who walked the young woman to the nearby pregnancy help center, where she received positive, life-affirming assistance. “God is so very good,” said one of the vigil participants. “At our Springfield Planned Parenthood, a young woman came out and gave me a hug and said she was going to keep her baby!” said Claudia, the local coordinator. Patti said after they had wrapped up their discussion, they started their car and drove away. She’s praying that this couple, like many others before them, have chosen life. Tags: 40 Days for Life, Mar 2015, 1st Campaign, Day 38, St. Louis, Missouri, Louisville, Kentucky, Springfield, Illinois, San Fernando Valley, California To share or post to your site, click on "Post Link". Please mention / link to the Greater Fitchburg For Life. Thanks! Shawn Carney, Campaign Director, 40 Days for Life: Many people are unaware that abortions happen on their own streets ... until 40 Days for Life campaigns shed light on this reality. As more people find out ... the abortion business is not always viewed as a welcome neighbor. Here’s one 40 Days for Life location where Planned Parenthood’s facility is becoming more and more isolated. The 40 Days for Life vigil in Vancouver takes place outside a Planned Parenthood center in a small shopping center. This business is practically surrounded by empty storefronts with “for lease” signs in their windows. But on this day, a small sign was posted on the door: “Sorry for the inconvenience, but our health center is closed.” The sign listed shortened office hours later in the day. “We are hoping and praying hard that this is an indication that they might be considering closing this facility permanently,” Ed said. Abortion is not legal in Tampico ... and the volunteers there are praying and working hard so it remains that way. As this mom prayed, she watched as a young couple went in and out of the abortion center several times. This all ended when the woman came storming out. The volunteer saw an opportunity to talk to her, and asked if she needed assistance. After a bit of discussion, the mom drove an emotional young woman to the pregnancy help center. After talking with the counselors there, she decided to keep the baby. “The girl left without the guy,” Connie said, “and the volunteer drove her about two hours to meet her family so she could move back home.” The baby is safe, but this is a difficult situation. Please keep this family in your prayers! Tags: 40 Days for Life, Mar 2015, 1st Campaign, Day 37, Vancouver, Washington, Tampico, Mexico, Norman, Oklahoma To share or post to your site, click on "Post Link". Please mention / link to the Greater Fitchburg For Life. Thanks! A young mother in West Africa was contemplating abortion…until she came upon our page. Brian Fischer, Online for Life: When Online for Life launched its Facebook page, we never imagined that in just a little over four years we’d grow to nearly 635,000 followers. All we knew is we had a unique pro-life message to share—a message that by and large was not being presented. From day one, we wanted to be known as a nonprofit organization that presents the raw truth about abortion, but does so in a compassionate and loving manner. As a result, the Online for Life Facebook page has become one of the most active social media sites in the pro-life space. Our formula is simple: we pair beautiful graphics with powerful truths and post them to our page every day. The result is a dynamic and active page where people of all backgrounds, religions, and ethnicities freely respond with their thoughts and ideas. Our Facebook posts often garner at least 5,000 Likes, with more provocative posts reaching as many as 15,000 Likes! “Bali” contacted Online for Life via Facebook on February 12. In her final year as a university student, “Bali” discovered she was pregnant. Unfortunately, her boyfriend of four years denied any responsibility for their child and pressured her to abort. With no family or friends willing to support her, “Bali” felt completely alone and believed abortion was her only solution. After hours spent sitting in front of her computer, reading stories and studying the Facebook graphics, “Bali” decided to keep her baby. She immediately emailed our team and described the impact our Facebook page had made in her decision to choose life for her child. Inspired by the life-saved stories featured on the Online for Life wall, “Bali” was able to stand up to her friends, family, and boyfriend who were pressuring her to abort. “Even though my boyfriend and my family have turned their backs on me, I know I could never abort this baby.” With firm conviction, “Bali” added, “I know God will see me through.”Online for Life has remained in constant communication with “Bali,” doing what we can to support her in her courageous decision. After making several calls to local charities, we were able to find her housing and employment after she graduates in May. “Bali’s” story reminds us of the power of social media in changing hearts and minds regarding life. Regardless of time zone or continent, Online for Life can reach people all over the world with the compassionate message of life. We invite you to join our Facebook page and become a part of this important conversation that’s changing the face of the pro-life community on social media. Tags: Online for Life, Facebook Page, West African woman, save unborn baby, no abortion To share or post to your site, click on "Post Link". Please mention / link to the Greater Fitchburg For Life. Thanks! Shawn Carney, Campaign Director, 40 Days for Life: At the beginning of a 40 Days for Life campaign, those driving by are often judging the prayer vigil. At first, the reactions vary from supportive honks to perhaps a distasteful shout or gesture. As the campaign goes on, those passing by see you in all sorts of weather conditions ... and even if they disagree with you, over time they come to respect you. Their attention may turn from you ... to the reality of abortion in their community. We have seen people who mock the vigil during the first week of the campaign actually join the prayer participants in the final week. Here are some stories from three different countries. “The majority of the time we will not know the fruit of our prayer or work to promote and save lives,” said one of the leaders in Auckland. But occasionally, God will reveal His blessings. A woman approached the prayer team outside the abortion center. They recognized her. At last year’s 40 Days for Life vigil, she was one of the most vocal opponents. They learned that her vocal abuse was a manifestation of the deep hurt she experienced after being forced to abort three children. Finally, this mother went to God in prayer. Today she is praying for the 40 Days for Life effort, with plans to join the vigil if she is able. Michele in Calgary was a bit concerned. She was alone at the 40 Days for Life vigil, holding a sign with the message “Women need support, not abortion.” As she prayed for the women entering the abortion center, she cried and wondered if her prayers were making a difference. The police had been called earlier in the day after someone complained about a sign. Now, Michele saw a woman outside the building, talking on her phone. She stopped in the driveway and pointed directly at Michele. “God uses every encounter we have at the abortion clinic,” said Julia in Baltimore, “no matter how seemingly small.” Such was the case in an exchange between one of the 40 Days for Life volunteers and a passing driver. Tags: 40 Days for Life, Mar 2015, 1st Campaign, Day 36, Auckland, New Zealand, Calgary, Alberta, Baltimore, Maryland To share or post to your site, click on "Post Link". Please mention / link to the Greater Fitchburg For Life. Thanks! Shawn Carney, Campaign Director, 40 Days for Life: This has been a cold 40 Days for Life campaign in northern climates -- especially in Moscow, where volunteers are hosting their third vigil. Despite the cold, the campaign in Moscow continues to grow ... and save lives from abortion. Whether it’s in the cold of Russia or the warmth of Florida, God is answering prayer ... and sometimes in suprising ways. Yesterday, we shared the video celebrating 10,000 babies saved from abortion during 40 Days for Life campaigns. That video shows there are no coincidences. When you have faith, when you trust God and when you defend what is good ... God responds. And that’s not a coincidence! Some unexpected events unfolded at the 40 Days for Life campaign in Moscow. We sometimes hear complaints about vigil participants’ signs. But in this case, there were complaints about the abortion center’s sign. The volunteers heard the abortion center’s doctors no longer do abortions after 12 weeks of pregnancy – a change from previous practices. That’s at least a step. The team also knows of two babies saved so far. One was the child of a married couple. “They already have a 4-year-old,” Arevik said. “The father didn’t want the abortion, but the mother did.” She didn’t think she could raise two young children. Another woman spoke to one of the prayer volunteers … and she too changed her mind. Tom in College Park reminded the 40 Days for Life volunteers that they themselves are often a sign – a sign to the women arriving for abortions, of course. A prayer volunteer told Maryanne, the local leader in Lakeland, that as she and her daughter were praying at the 40 Days for Life vigil in Lakeland, they watched a car drive up to the abortion center – with another mother and daughter inside. The younger woman went into the building for a while … then came back out. She and her mother sat talking for some time. She had tears in her eyes as she told her story and explained her decision. The volunteer recommended the local pregnancy help center, which could offer just the sort of assistance she was looking for. Tags: 40 Days for Life, Mar 2015, 1st Campaign, Day 35, Moscow, Russia, College Park, Maryland. Lakeland, Florida: To share or post to your site, click on "Post Link". Please mention / link to the Greater Fitchburg For Life. Thanks! 40 Days for Life, Mar 2015, 1st Campaign, Day 34, Video - - 10,000 Lives Saved! Shawn Carney, Campaign Director, 40 Days for Life: We start off the final week of this 40 Days for Life campaign with HUGE news! Since the first coordinated 40 Days for Life campaign in 2007, we have now received cumulative reports of 10,000 babies who are alive today because their mothers rejected abortion and chose life! 10,000!! To God be the glory … great things He has done! A young couple had just left Planned Parenthood when a 40 Days for Life prayer volunteer caught their attention. As they talked, they explained that they didn’t think they could afford another child. It turns out they couldn’t even afford the $75 Planned Parenthood wanted to charge them for an ultrasound. That’s when the vigil participant said they could get a free ultrasound at a nearby pregnancy help center. When the center’s director heard this couple was on the way, she dropped everything and headed back to arrange the ultrasound. All this time, the young man and woman smiled as they read a brochure about the development of the baby – and talked about what they were seeing. The Houston team tells of a woman who was going to Planned Parenthood to schedule an abortion. But when she got there, the place was closed. But even though Planned Parenthood was locked up for the day, there was a man praying on the sidewalk. She spoke to him, and he gave her a coupon for free services at the Big Blue Bus – the mobile pregnancy help center that spends many hours every week parked outside the abortion center. A few days later, she returned and told the counselors on the bus she was there to redeem her coupon. She had changed her mind and chosen life for her unborn child! The 40 Days for Life vigil in Sharonville takes place outside a business that stopped doing surgical abortions … but still offers chemical abortions. So the volunteers keep praying … and learning that their prayers are being answered. A young woman who was entering the abortion center accepted some information from volunteers, but went inside anyway. She left … and returned a few days later. But this time, when she came out, she told the volunteers she had changed her mind and was keeping her baby. Tags: 40 Days for Life, Mar 2015, 1st Campaign, Day 34, video, 10,000 Lives Saved, Tempe, Arizona, Houston, Texas, Sharonville, Ohio To share or post to your site, click on "Post Link". Please mention / link to the Greater Fitchburg For Life. Thanks! 40 Days for Life Day 16 - Ask everyone!